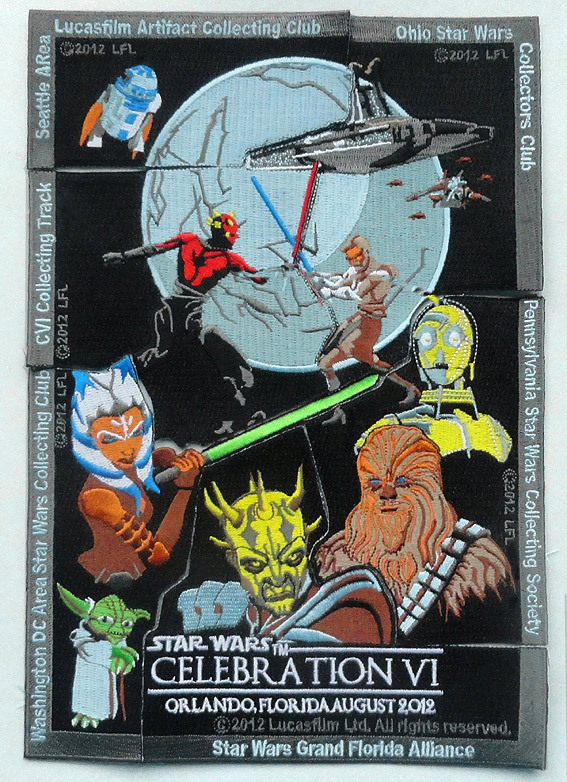 Five Star Wars collecting clubs along with the Celebration VI Collecting Track will mark Celebration VI by giving away sections of an exclusive 6-piece patch set. When assembled, the pieces form a Clone Wars themed movie poster. The poster features characters from all six movies of the Star Wars saga along with characters from The Clone Wars TV series. The clubs participating in this project are the Washington DC Area Star Wars Collecting Club (DCSWCC), the Ohio Star Wars Collectors Club (OSWCC), the Pennsylvania Star Wars Collecting Society (PSWCS), the Star Wars Grand Florida Alliance (SWGFA), the Seattle ARea Lucasfilm Artifact Collectors Club (SARLACC) and the Celebration VI Collecting Track. Lead designer Bill Cable of PSWCS conceived the idea for the patch, and completed the design with substantial assistance from leaders of the participating groups. All six patches will be available exclusively at Star Wars Celebration VI and will be free to attendees. Because quantities are extremely limited, the patches will be given away one per person. Four clubs will be distributing their patch pieces at their Fan Group booths on the convention floor. Please visit their web sites for additional information about the clubs. The other two groups will be giving away patches in the Collecting Track Social Area in room W304CD. Please visit the room for schedules and additional distribution information. If you have any questions regarding this project, please contact Martin Thurn of DCSWCC at press@dcswcc.org.